Last weekend I managed to tick off another of my goals for 2018 – by volunteering to do some trail building at Cannock Chase with Chase Trails. Cannock Chase is my nearest trail centre, and the one I ride the most, so I had been feeling like I should put something back. Trail building session run every Sunday – meeting at 10:00 at the Cannock Chase Cycle Centre, and volunteers are encouraged to join in. I was surprised to find that I was the only new volunteer, joining the small team of regulars – given how many people ride the trails I expected there to be a bigger team maintaining the trails. Having said that, Alex, who ran the skills course I did last month also joined for a few hours. They may lack helpers, but the trail builders were well equipped – the first job (after the health and safety briefing) was loading tools into their awesome remote control mini dumper – much easier than carrying them up the hill! The dumper was also great for collecting the materials to surface the trail and for digging. We were working on the first part of the “Rock N Rollers” section, which will be renamed “Snakes and Adders”. The first part will stay much the same, but the second part will be totally different when it opens. At the worksite the first task was to finish digging a trench for a drainage pipe – I was impressed at how much effort goes into making sure water does not run down/pool on the trail. It is definitely appreciated, especially as I mainly ride at Cannock in the winter. With the pipe fitted and covered up, the trail surface could be laid. It was quite a slick operation, with one person using the mini dumper to bring the material, two to spread and shape it and another using the whacker to compact it. We made swift progress until reaching the next section requiring drainage work, and the cycle repeated. Before long it was time to pack up the tools and have some cake, having resurfaced about 25 metres of trail and dug three drainage channels. You may be thinking that 25m isn’t a lot of trail to have been resurfaced in a day, or week, as these build sessions happen weekly. However, to work quicker they need more volunteers – so if you are a regular up at Cannock Chase, please consider joining the trail builders for a day, or even for an hour as you are riding past! I found it to be a fun and rewarding day and I am extra keen to ride the “Snakes and Ladders section, knowing that I helped build it. I will be joining Chase Trails again in the future for more trail building – hopefully I’ll see you there too! 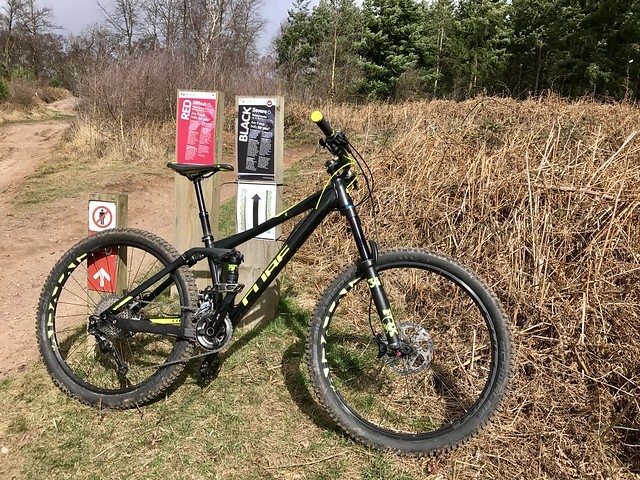 The annual Leisure Lakes Demo Day at Cannock Chase is the highlight of my mountain biking year – it is a chance to check out the latest kit, and try a few bikes on trails I know fairly well. As I don’t need to take my own bike, it means I can drive to Cannock Chase in the MR2, which makes it even more fun! 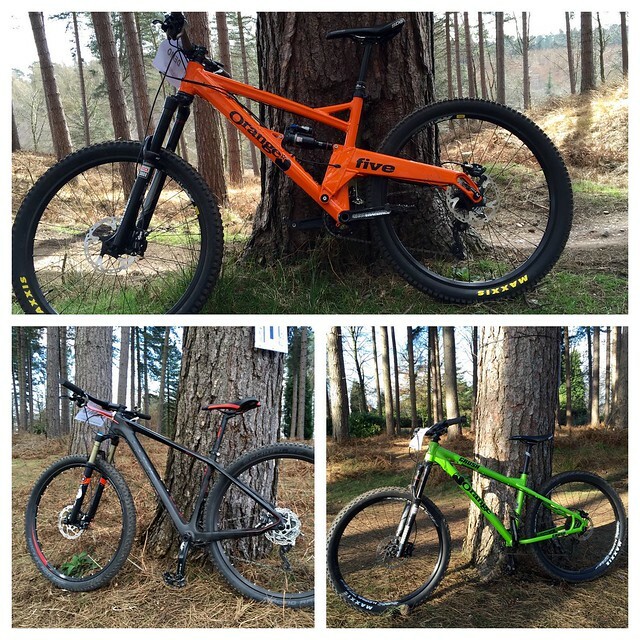 After signing on I went to the Whyte stand, as the T-130 was top of my list of bikes to try. Unfortunately they were all out being ridden, so I opted for a 905, which is a much better version of my current bike. I thought it would be a good bike to base all the other reviews on. The 905 did feel better than my bike, but the SRAM gears took a bit of getting used to. I was struggling on the bumpy trails, especially the long rooty section at the end of the lap, I thought I was just unfit/out of condition, but didn’t have the same issues on the full suspension bikes I rode later in the day. If I was looking to replace my current bike, the 905 would be a top contender. The 120mm travel version of this bike is high up my list of possible next bikes, but they only had 29” or 140mm suspension versions to demo. I opted for the 140mm 27.5″ wheeled model to demo. I rode last years version of this bike at the previous demo day. I was on the 16” frame version, which felt quite compact, I later sat on the 18” version which fitted me well – this isn’t always a given, as I have a long body and short legs. Dropping in to the Son of Chainslapper section, which is a lot bumpier than I remember, the Cube felt so much more planted than either the Whyte 905 or my hardtail. Within seconds I knew my next bike would have both front and rear suspension! What I hadn’t expected was how much smoother the rooty climb would be on a full suspension bike. I arrived back to the demo area feeling a lot better than after riding the Whyte 905 and it wasn’t just down to the 2×11 gearing! On the subject of gears, the Cube was the only bike I rode with Shimano gears, it may be down to familiarity, but I just cannot get on with SRAM shifters. The downside to the 2×11 setup was that the dropper seatpost lever wasn’t easy to reach, on a couple of occasions I went for the left shifter instead of the dropper post. After lunch I planned to take a walk around the various stands, but spotted an Orange Four on the Hope stand. An Orange Four, especially one dripping in Hope bling is my dream bike. As it was in my size it would have been rude not to see if it lived up to my expectations! Aside from the colour, the only thing I would spec differently would have been Shimano, rather than SRAM transmission. I could feel the quality of the bike from the first few pedal strokes and it was a dream on the rough downhill sections. It also climbed as well as the Cube, despite only being 1×11 – the Hope 44 tooth cassette helped there! I must admit that when I got home I had a look at the Orange website to see if I could afford a lesser specced Four – unfortunately even the cheapest model is significantly above my budget. I have certainly found a bike to benchmark all other potential new bikes against though! 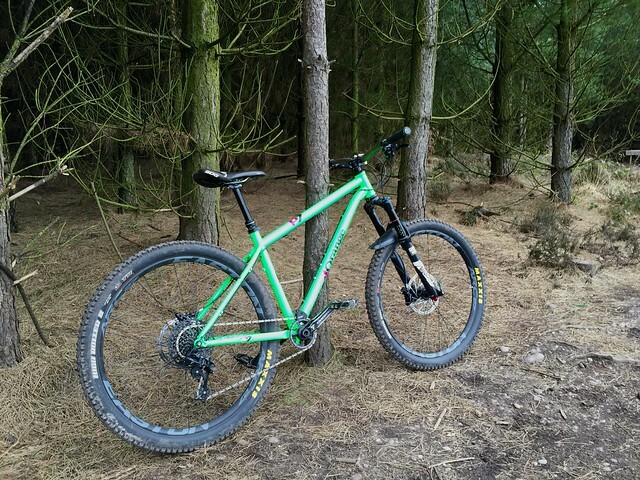 My fourth, and final, ride of the day was on a Whyte T-130s, I had high expectations for the full suspension Whyte. These were compounded by the fact it took my three visits to the Whyte stand to find one in medium, which I thought would be my size. Unfortunately, the medium frame was too big for me, the seat wouldn’t go low enough. Luckily I was able to take our a small frame instead, however it felt ever so slightly cramped. I don’t know if it was how the suspension had been set up, but the rough sections, especially braking bumps, didn’t feel as smooth as with the Orange or the Cube, yet it managed to feel bouncier than either on the climb. I don’t know if riding the T-130s after the Four had recalibrated my expectations, but I found that the Whyte didn’t live up to the hype. I don’t think I’ll be buying any of these bikes, unless I win the lottery, in that case I’ll have an Orange Four, with all of the Hope bits. However, I have got a much better idea of what I want when I start bike shopping in earnest – short travel full suspension with Shimano 1×11 transmission and a dropper post! As I had such a good time at the Leisure Lakes Demo Day last year, I made sure that I would be attending this year too! When I got there I went straight to the Orange stand, hoping to try a Four – seemingly along with everyone else! When I got the front of the queue all they had in my size was a Crush, keen to get out I took it for a spin. I enjoyed the bike and seemed to get a lot of PRs on Strava, although looking at the trace when I got home it seemed a bit fishy, skipping a few sections out. Dropping the Crush back I clocked a nice looking P7, which I didn’t realise Orange had brought back. The next bike I wanted to try was a fat bike, I’d noticed Cube had some, but the person in front of me took the last one out. Gutted. I settled for a Stereo 140 Race, which is a potential next bike. The spec was good, full XT 2 x11 and a dropper post – my next bike will have one of those! This being only the second time I’ve ridden a full suss bike, it was a lot smoother than the hardtails, especially on braking bumps. There was one section, into and out of a dip where the Cube was the only bike I didn’t lose traction on and made it up the other side. The bad point was all the pedal strikes, I was on slightly chunky DMR V8 pedals, but the pedals were striking way too often. I didn’t notice strikes with the other bikes. I headed back to Orange to try my luck getting a Four, but settled on the P7 I’d spied earlier. Not having ridden a steel framed bike before, it was interesting to test one with almost the same geometry as the Crush I’d ridden earlier. The spec on the P7 was better though, SRAM 1×11 with Pikes and a dropper post. The SRAM shifter took some getting used to, but not enough that I’d rule out a bike because it had SRAM. 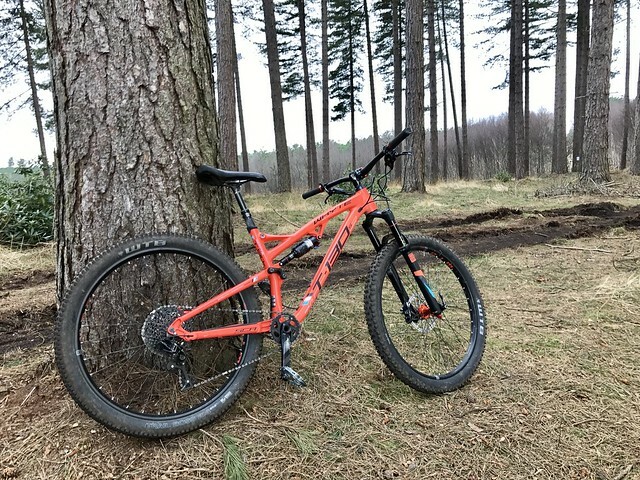 The P7 felt more fun than the Crush and even had me thinking that an expensive hardtail would be a better bet than a cheap full suss for my next bike. It was also the only bike I took a picture of. The event seemed better organised than last year, especially signing on. The route was better too, with less fire road, although the long rooty section was particularly energy sapping. I’m not any clearer on what my next bike should be an I didn’t intend on writing that much, but it was a fun day out. As mentioned last year, I have taken up mountain biking. 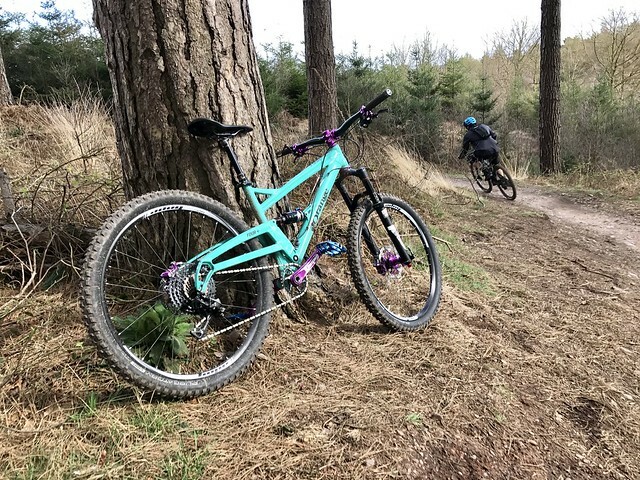 Most of my riding has been from home in Coventry, but I have managed a few visits to trail centres at Sherwood Pines and Cannock Chase, where the terrain is trickier and the hills steeper – perfect for mountain biking. My last visit was for the Leisure Lakes bike shop’s demo day, where rather than riding my own bike, I was able to try out some of the latest bikes. The first bike I rode was an Orange 5 (the orange one in the photo above) a full suspension bike, possibly worth more than my car! Immediately I could tell how fast the bike was, through the “Snow White” section of trail the rough braking bumps were flattened. The quality of the components really shone through, gears shifted exactly when I needed them to and the dropper seatpost allowed me position myself on the bike perfectly for riding both down and up the hills. However, all the amazing technology in the suspension and seatpost means that the bike is quite heavy and I struggled on the climbs. Overall I’m glad I’d ridden a 5, as they are legendary bikes, but as well as being over budget it would be complete overkill for the type of riding I do most of the time. Next I tried the Cube Reaction GTC SL 29, not a bike that was on my radar, but one of the few bikes with out a queue to ride it! The first thing I noticed was that I was almost being shaken off the bike on the braking bumps which the 5 flattened, it was only when I stopped for a breather and picked up the bike that I realised just how light it is – I later learned that is weighs 10.5kg, I’m used to a 14+kg bike! Like the 5, the gears were great, shifting perfectly, so combined with the lack of weight I found the climbs much easier. This sealed the deal, my next bike will be another hardtail. The only downsides I noticed was that with the bigger wheels I struggled on some of the tighter hairpin sections, but it wasn’t as bad as I had been expecting for my first time riding a bike with 29″ wheels. Whilst I really enjoyed riding this bike I’m not convinced it is for me, even the smaller wheeled version – it just didn’t feel sturdy enough for a heavy/clumsy rider like me. On this ride I also tried a pair of Oakley Prism Trail Racing Jacket sunglasses, which I was really impressed with, the trail seemed clearer than with my old Oakleys, which had that morning suffered in the “glovebox of death” in my MR2, and are now unwearable. Perfect excuse for a new pair of sunglasses! The last bike I rode was the Orange Crush AM, the green one. 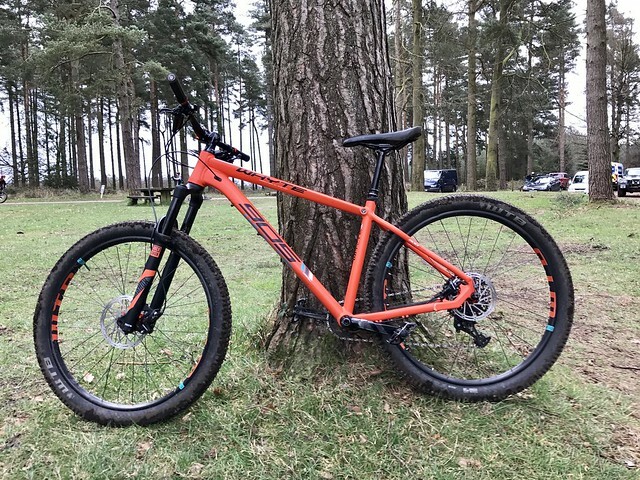 This is the bike I had really wanted to ride all day, it is between the Cube and 5 in terms of weight and terrain it can cope with and is pretty much my perfect bike. So to say I was disappointed when I got to the front of the queue at the Orange stand to see them dismantling it for parts to keep a 5 going, is an understatement. The guys were really helpful though, and on hearing that I was waiting for that bike managed to get it back working again, albeit without the front mech connected. The first section of trail, called “Son of chain slapper” is my favourite and I completely gelled with the Crush on this section, I felt way faster than I’d ever ridden down there and other than the rough “Snow White” section, this continued for the rest of the ride. After the other bikes with top of the range components, the Crush felt more like my bike – a bit clunky and slow to shift, but I could tell the basics of a good bike was there. I even handled the climbs OK, without the small cog at the front. What I’d felt whilst riding was validated when I checked my Strava times and I’d set a number of Personal Bests! 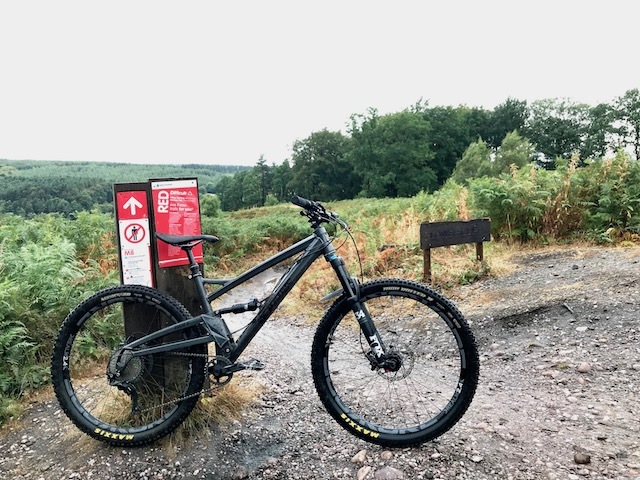 I left Cannock Chase thinking that as great as the Crush was, my bike is still pretty good – the difference certainly isn’t worth the £1000 difference, but riding the Cube made me realise that my bike does need to shed some weight (as does the rider). Most of all it was a great day in the sunshine, and I got to meet Andrew Woodall, whose mountain bike photos on Twitter pretty much convinced me to buy a bike. A quick note on the photo, it was created using an iPhone app called Diptic, I’m slightly annoyed as I didn’t think about making a triptych when I took the photos, and I framed the shots too tightly. 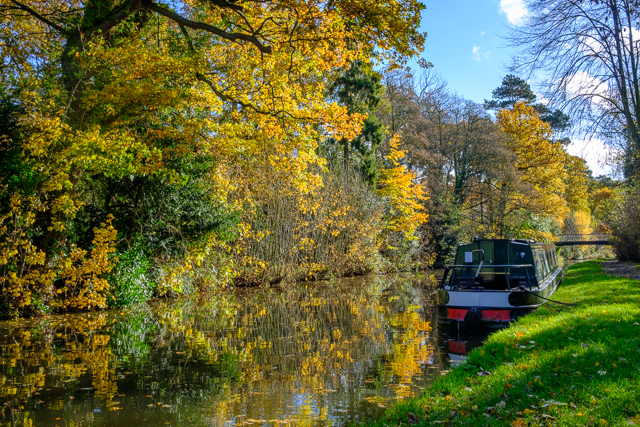 One of the golden rules of photography is to consider how you will process/display the photo as you are taking it – I won’t be forgetting that again!